Save even more £££ with the Bathrooms and Showers Direct loyalty programme. The best way that we can say a BIG THANK YOU is by giving our customers the opportunity for even better deals through the Bathrooms and Shower. The best way that we can say a BIG THANK YOU is by giving our customers the opportunity for even better deals through the Bathrooms and Showers Direct Loyalty Programme. How do I apply for the Bathrooms and Showers Direct Loyalty Programme? You will be automatically registered for the BASD Loyalty Programme with your first order. How much does 1-point equal? Each point is equivalent to £0.01. So for example, if your first order is worth £500 you will receive 500 points. Your 500 points are equivalent to £5.00 off your next order! Simple – during the check out process when you place your next order you will be asked whether you wish to use your points or not. However, please note that you will need to be logged into your account during the checkout process. How many points can I use against my order? You can use up to 10% off the value of the order (ex VAT and delivery charge). This means if you have 500 points worth £5.00 and your new order value is £50.00 you have the option to save a further £5.00!! Do I keep my points if I don't use them immediately? Do I keep my points if I do not use these immediately? Yes do not worry. If you decide not to use your points during your order they will be kept for the next time you use Bathrooms and Showers Direct. Can I use my points against products on Special Offer? Can I transfer my points to my friend? Please feel free to contact the BASD customer service team for further information atinfo@bathroomsandshowersdirect.com or using the instant message service provided at the bottom right hand corner of the page during normal office hours. 2.1 The Customer Loyalty Programme is open to anyone aged 18 years or above who orders goods via the Site. 2.2 You will be automatically registered for the Customer Loyalty Programme when you make your first order via the Site. Your individual online account will record the number of points earned. 3.1 The Customer Loyalty Programme will commence from 17 July 2013. Points will be awarded against any orders backdated to 1st January 2012. 3.2 You will earn 1 Point for every complete £1 you spend on orders made via the Site. The value of the Points attributable to your order will be determined and made clear prior to checkout. 3.3 Points are earned on the net value of the order plus VAT and additional charges if applicable. 3.4 In the event you receive a refund on goods, all Customer Loyalty Points received as a result of that purchase will be deducted from your current balance. 3.5 Points are issued by us and remain our property. 3.6 Points shall become invalid if and when your account is closed and may not be subsequently redeemed. 3.7 Please note that your Points balance may not be updated immediately when you make an order. You may need to wait 24 hours before the points show in your account. 4.1 You must be registered and signed-in to the Site to be able to redeem Points. 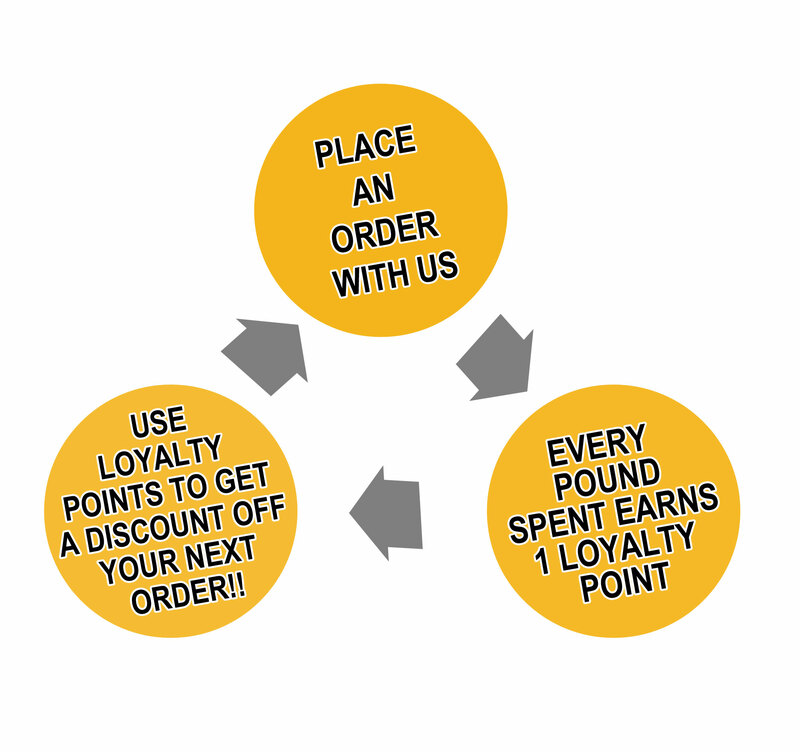 4.2 Points are automatically awarded from your first order and thereafter can be redeemed against any future orders. Your Points must be redeemed during the checkout stage of your order. 4.3 Points can be exchanged for a discount off a future order via the Site. Points can be exchanged for up to 10% of the value of the goods excluding VAT and any additional charges. 4.4 Points are valid for a period of 12 months from the date of award and cannot be sold or exchanged from one customer to another. 4.5 All prices and Point exchange rates and products and services may be amended at any time. Taxes and other duties, when they are applied, may be subject to alteration without notice. 5.1 We reserve the right to amend or terminate the Customer Loyalty Programme or these Conditions at our sole discretion at any time, with or without notice. 5.2 We reserve the right to remove you from the Customer Loyalty Programme at any time at our reasonable discretion. 5.3 We may refuse to redeem Points and/or authorise the issue of Points if we consider that the Customer Loyalty Programme and/or the account are being misused, or if you are in breach of any of these Conditions. 5.4 We reserve the right to close any account that has been inactive. If we do this, we will notify you in advance. 5.5 These Conditions are subject to English Law. Our liability for a breach by us of these Conditions shall be limited to you. If you suffer loss as a result of such breach, our sole liability shall be to credit you with Points in the event that such Points were incorrectly deducted or should have been credited but were not. 5.6 Nothing in these Conditions shall limit our liability in respect of death or personal injury caused by our negligence. 5.7 In the event of any conflict or inconsistency with any other communication, including advertising, marketing or promotional material, these Conditions shall prevail. 5.8 All notices sent by you to us must be sent to Bathrooms and Showers Direct at 15-17 Margaret Road, Barnet, Hertfordshire, EN4 9NR - England & Wales or send an email to us at info@bathroomsandshowersdirect.co.uk. We may give notice to you at either the e-mail or postal address you provide to us in the Order. Notice will be deemed received and properly served 24 hours after an e-mail is sent or 3 days after the date of posting of any letter. In proving the service of any notice, it will be sufficient to prove, in the case of a letter, that the letter was properly addressed, stamped and placed in the post and, in the case of an e-mail, that the e-mail was sent to the specified e-mail address of the addressee. 5.9 The Customer Loyalty Programme is administered by the Company. “Contract” the contract between you and us for the sale and purchase of the Goods in accordance with these Conditions which comes into existence in accordance with Condition 1.5 of our Supply Terms and Conditions. “our”, “us” and “we” Fayers Building and Plumbing Supplies trading as “Bathrooms and Showers Direct” a company registered in England and Wales with company number 00187552; VAT number 856391984 whose registered office is at 15-17 Margaret Road, Barnet, Hertfordshire, EN4 9NR - England & Wales. “you” and “your” the person that has accepted these Conditions including Distance Consumers and Home Consumers. 6.2 References to any statute or statutory provision include, unless the context otherwise requires, a reference to the statute or statutory provision as modified or re-enacted and in force from time to time and any subordinate legislation made from time to time under the relevant statute or statutory provision. 6.3 References to “persons” include natural persons, firms, partnerships, companies, corporations, associations and organisations, (in each case whether or not having separate legal personality). 6.4 Use of any gender includes the other genders. 6.5 Words in singular include the plural and words in the plural include the singular. Any reference to “writing”, “written” or any other cognate expression includes communications by post and email but excludes facsimile and text messages. 6.7 The headings to Conditions do not affect the interpretation of these Conditions.